Eat your heart out, Boston! We have our own Big Dig in Washington, DC, at the National Zoo, and ours has elephants in it! Well, maybe it’s not quite as Big. But it’s certainly been transforming the core of the zoo for the past fifteen years—on every visit you have to navigate construction equipment and major piles of dirt, although not always the same piles—and it ain’t over yet. First we got big splashy Amazonia Habitat with its science gallery; then Think Tank, for research into primate (as opposed to primary) education, with the crowd-wowing outdoor overhead O-Line for the use of orangutans when they decide to move between buildings. This was followed by completely redesigned panda exhibits to welcome for their honeymoon a new young panda couple, parents of hugely popular Tai Shan. Then came Asia Trail, with its green roofs, convincingly sculpted rocks, and several new endangered species for the zoo’s species preservation program. 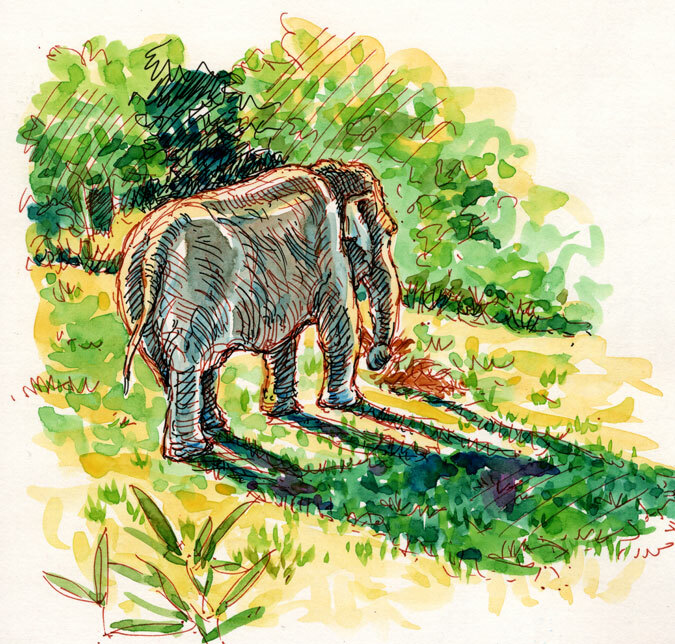 Now the major project under way is Elephant Trails, a research and breeding program to preserve the endangered Asian elephant, which will provide an expanded herd with a more natural and environmentally friendly environment. Phase 1 opened this summer, and on a recent walk I had a look at the elephants munching breakfast near a big new stepped pond, in well-kept rolling grassy fields, like a high-end retirement home. I don’t know what the elephants think, but I’m ready to move in. You can learn more about it at the zoo’s website, and even make a donation and get your name on a plaque. 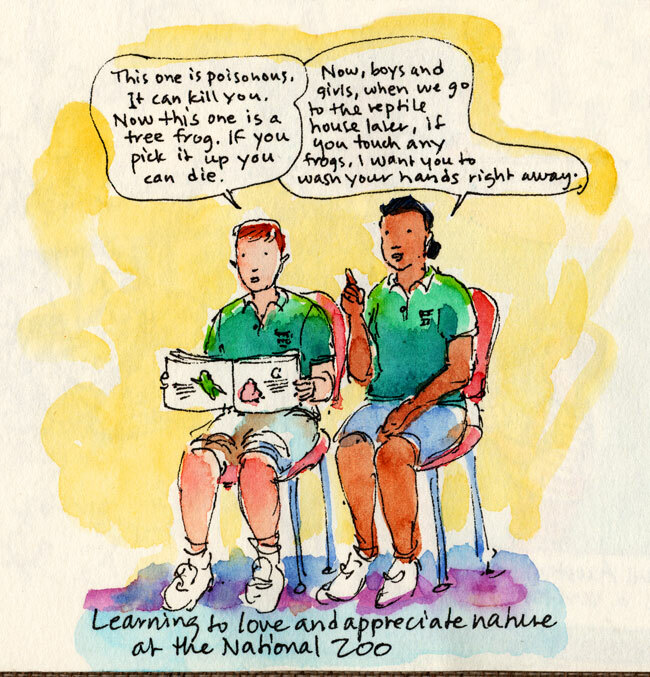 This is a heads-up that the LAST National Zoo Sunset Serenade of the summer takes place tomorrow night—Thursday, August 5th (weather permitting), from 6:30 to 8pm. 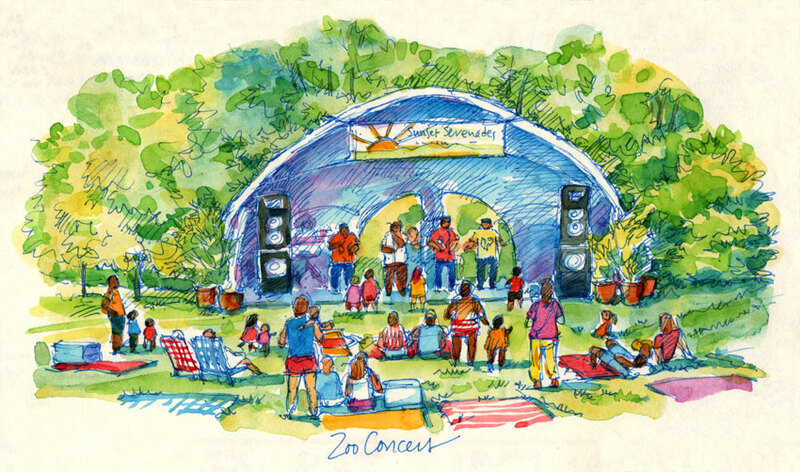 If you have never attended any of these free outdoor concerts, then this is your last chance (this summer, anyway) to pack a picnic dinner and join the fun on Lion-Tiger Hill. The evening usually ends with spontaneous barefoot dancing. According to the Zoo website, tomorrow’s group is The Grandsons, performing from their WAMMIE Roots Rock-winning albums. 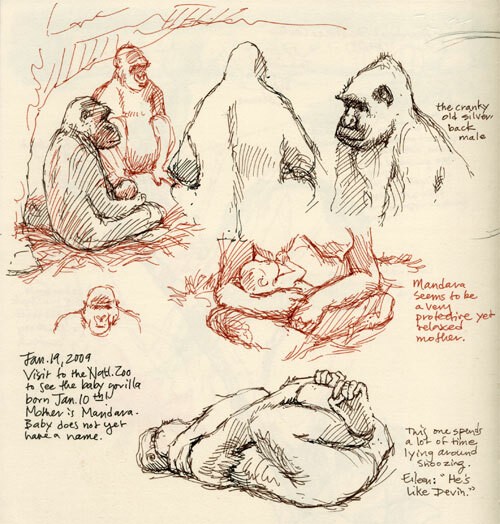 Another January zoo sketch. January is a great time to visit the zoo; it’s usually very quiet (unless there’s a new baby), yet the animals are lively. 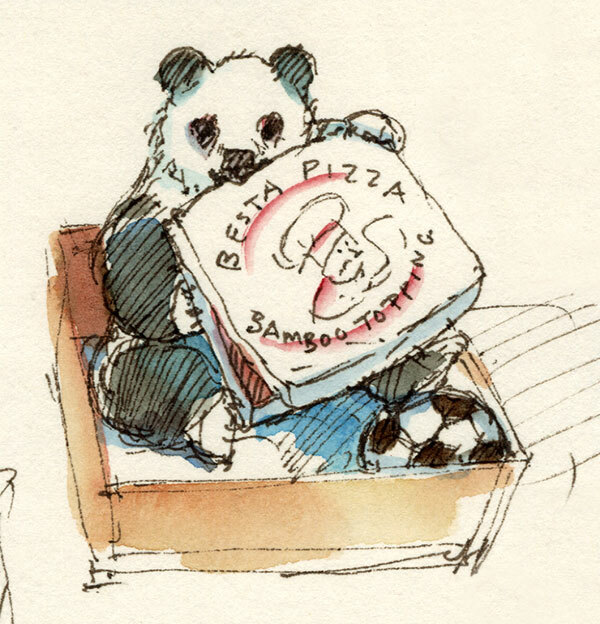 Here’s baby panda Tai-Shan (“Peaceful Mountain,” named by popular vote), who had been given a soccer ball but preferred to chew on an old pizza box. The Christmas morning cliche! By previous agreement between the U.S. and China, Tai-Shan, now four years old, is to be returned to China this year. There is a farewell party for him on January 30th. The zoo and zoo visitors will miss him.